Note: Suggest buying in pairs for your normally talking use. 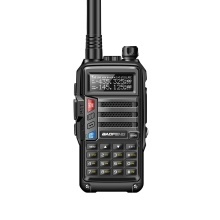 *Dual-band handheld transceiver(VHF 136-174 MHz UHF 400-520MHz),long range walkie talkie,widely used for supermarket,office,shopping center,villas,hiking,hunting and outdoor activities. *With the functions of VOX,LED flashlight,battery saving,alarm function,key lock,high definition audio,communication is more comfortable. *CTCSS/DCS:105 codes "DCS" and 50 privacy codes "CTCSS" programmable,which can avoid listening to the same channel on the irrelevant call. *2800mAh large capacity battery for long standby time,high/low power(8W/1W) switch. *Support multiple charging modes:USB charging cable,battery charger and car charger cable(power adapter for battery charging is included,other items are not included). *128 channels adjustable,clearer talking and longer range,stable performance,mini size,easy to hold in hand and operate.